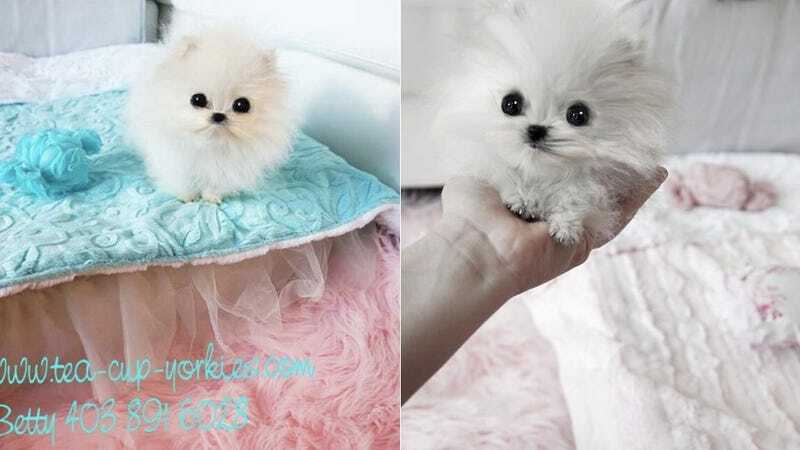 Big doings for Paris Hilton: She has just purchased a tiny, tiny Pomeranian named Mr. Amazing for $13,000. Which is a stupid amount of money but OMFG LOOK AT THE FLUFFY WUFFY!!!! It's like a cotton ball with googly eyes glued on! ONE IN A MILLION micro tiny little boy Mr.Amazing. He is 4.5 months old only 10ounces he is amazing. Triple white ice coat with the flatest bear face ever !!! super short compact cob by body with the shortest little legs ever. He has big round eyes ,Ones like him are very hard to find dont miss out on this amazing little boy. we ship almost anywhere in the world with our nanny service. So that's your semi-annual update on the fabulous life of Willow Pape Paris Hilton. Expect Kim Kardashian to acquire a pet tiger by Monday. Photos via Betty's Tea Cup Yorkies/Instagram.